So maybe you’re thinking about jumping on these record low interest rates, taking the plunge, and buying a new home? Congratulations! It’s exciting, and there’s so much to consider. And being the thoughtful, caring person that you are, you’re probably looking into eco-friendly home options, which is wise. 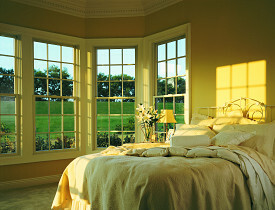 Traditional windows account nearly 50% of all the heat lost from an average home. See why windows are important? Energy-efficient models use modern technology such as protective coating, extra panes, and better frames, which work in conjunction with proper insulation to keep air in. As a bonus, these special windows block harmful UV rays, which is great for your body as well as the integrity of your interior. No more strange colored spots left behind when you rearrange furniture! Insulation in the floors, walls, and attic will keep the temperature constant – keep the heat out in the summer, and keep the cold out in the winter. Conversely, high-quality insulation ensures that your heating and cooling systems won’t be overworked, which reduces overall energy usage. This amazing material will effectively reflect over 99% of infrared radiation away from your exterior walls. In other words, the heat-carrying rays will not penetrate your home, keeping the inside nice and cool. But this works in reverse as well – during the winter the barriers will keep the vast majority of heat from being lost, so your heater will also work less. Radiant barriers are incorporated into the insulation, in a setup called a reflective insulation system. Modern, energy-efficient systems use less input and require less “work” to keep them running. They’re also quieter and reduce condensation or moisture in the home. Speaking of moisture, it’s important to make sure that every nook, cranny, crack, gap, or crevice in your ducts have been properly sealed. This will ensure that they’re not becoming gateways for drafts, water, dirt, dust, mold, pollen, or pests. Keeping the system running smoothly maintains healthy air and saves on upkeep down the road. The vast majority of roofs in America are made from dark tar or asphalt shingles. This may be aesthetically pleasing, but unless the roof is very well insulated, dark colored roofs can be heat magnets. Light-colored or reflective roofing materials cut down on heat absorption and can require less energy expenditure in the home underneath. A caveat: Even with "cool" roofing materials, the roof must be properly insulated and vented to be energy efficient. Look for the Energy Star official seal of approval on everything from dishwashers to washing machines, lighting fixtures to fans, and much more. This is the gold standard in efficiency, and is an absolute must in a modern, green home. In fact, did you know that an entire home can collectively earn its own Energy Star stamp? Look for the official rating on new construction. Who said being green wasn’t easy?